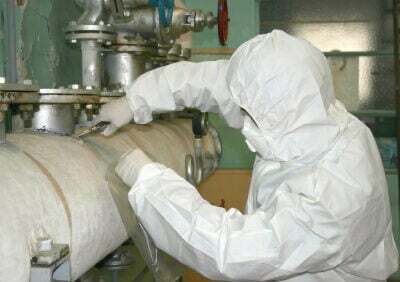 At Hazmat Services we specialise in asbestos sampling, asbestos testing and asbestos identification. Read on to know more. If you think there may be asbestos in your home or business the only way to be sure is to get a sample of the suspect material analysed. Testing can be performed on building materials and soils. Once samples are received, they are processed and analysed and you are issued with a NATA Accredited Certificate of Analysis. Polarized Light Microscopy (PLM) in conjunction with Dispersion Staining (DS) techniques. We often receive enquiries asking us how to identify asbestos by sight. Unfortunately, this is not possible. Asbestos identification cannot be done with the naked eye. The only reliable means of identifying asbestos is testing in a laboratory under a microscope, using processes such as PLM and DS. We strongly recommend that you get a professional in to sample potential asbestos products. Should you wish to collect your own sample, follow this step-by-step guide. You should always be careful when taking samples of materials you suspect contain asbestos. Wear a respirator (P2 disposable dust mask) and make sure it is fitted correctly. There should be no gaps between your face and the edges of the mask. You can buy these at your local hardware store. Carefully collect a sample using hand tools. DO NOT USE POWER TOOLS. – Cement sheet products – around the size of a 20 cent piece (approx 50-100 g). – Vinyl floor tiles/sheet – about half the size of your palm. Place the sample in a sealable container e.g. plastic sample jar or zip lock plastic sandwich bag. Clean your hand tools thoroughly with a wet wipe then seal the wipe in its own zip lock bag. If you are taking multiple samples, each one should be sealed in its own container to prevent cross contamination and a possible incorrect analysis results. Also make sure your tools are cleaned after each sample to prevent contamination. After completing the sampling, you should use PVA glue or paint to seal any broken material to prevent the release of airborne fibres. If you can, bring your sample(s) in person to Hazmat Services to Level 1, 45c Fitzroy Street, Carrington NSW. Call us first on 02 4961 1887 to let us know you are coming. If you can’t bring your sample(s) in person, call us on (02) 49611887 to make other arrangements. Why is NATA Accreditation Important? The National Association of Testing Authorities (NATA) is a nationally recognised accrediting body for laboratories. NATA is the organisation responsible for ensuring that testing facilities comply with national and international testing standards. They assess and evaluate technical expertise and provide formal recongnition of a laboratory’s competence. If you are trying to identify asbestos, make sure the testing is undertaken by a NATA accredited laboratory. Clients, other laboratories, regulatory authorities and the courts can have confidence in the test results. Otherwise, analysis reports may not be accepted by Safe Work NSW, local councils and other regulatory authorities.